Fox News host Bill O'Reilly has "recounted dramatic stories about his own war reporting that don't withstand scrutiny," including claiming that he covered the Falklands Islands warzone from which American reporters were banned, according to a Mother Jones report. 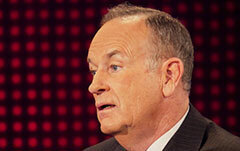 O'Reilly has repeatedly told his audience that he was a war correspondent during the Falklands war and that he experienced combat during that 1982 conflict between England and Argentina. He has often invoked this experience to emphasize that he understands war as only someone who has witnessed it could. As he once put it, "I've been there. That's really what separates me from most of these other bloviators. I bloviate, but I bloviate about stuff I've seen. They bloviate about stuff that they haven't." Mother Jones goes on to note several instances of O'Reilly claiming -- on television, in his syndicated column, and in hisbooks -- that he reported on the ground from active war zones, including the Falklands. American reporters were not on the ground in this distant war zone. "Nobody got to the war zone during the Falklands war," Susan Zirinsky, a longtime CBS News producer who helped manage the network's coverage of the war from Buenos Aires, tells Mother Jones. She does not remember what O'Reilly did during his time in Argentina. But she notes that the military junta kept US reporters from reaching the islands: "You weren't allowed on by the Argentinians. No CBS person got there." That's how Bob Schieffer, who was CBS News' lead correspondent covering the Falklands war, recalls it: "Nobody from CBS got to the Falklands. I came close. We'd been trying to get somebody down there. It was impossible." Mother Jones goes on to note inconsistencies in O'Reilly's claims that he reported from a violent protest in Buenos Aires and a battle zone in El Salvador. Neither Fox nor O'Reilly reportedly responded to Mother Jones' "multiple" requests for comment on the story.